The Data Contrast function can be used to contrast the twice measured results. According to the captured data, the function can be used to analyze the measured results and display the differences, which will be denoted by the curve “~” on the waveforms. So the Data Contrast function is mainly suitable for checking the good or defective products or contrasting and analyzing the before and after modified circuits, and so on. It is wasting time to trace one particular signal in a pile of complex signals. Now users can use the Latch function to set one particular signal in the paralleling Bus as the sampling site reference for analyzing, so as to filter some useless signals. Protocol Analyzer Trigger can be used to help users find the correct position of the packet in the complex packets of the Protocol Analyzer. In the case of this function, the options of the Protocol Packet are decided by the different Protocol Analyzers. We take the I2C for an example here. When we do the Packet Trigger function for the Packets of the Protocol Analyzer I2C, the Protocol Packets can be selected from the options, such as START, ADDRESS, READ, WRITE, A-ACK, D-ACK, D-NACK, A-NACK, ERROR and STOP. 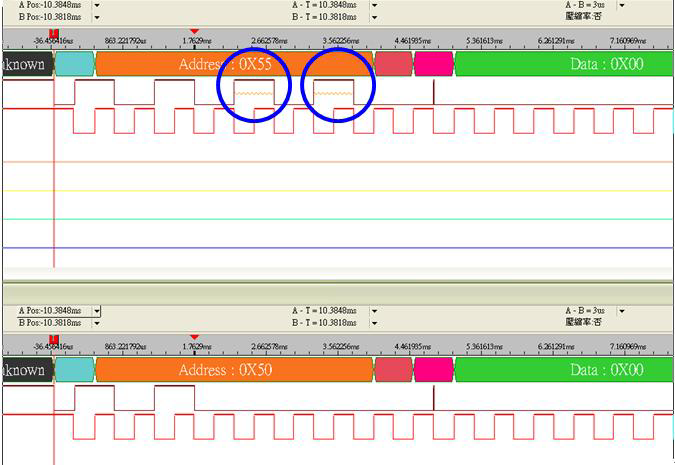 And the Value of the Protocol Packet can be entered according to the requirements of the Protocol Analyzer I2C. Display all packets can shorten the time to find the trigger targets, used along with Bus Trigger it can quickly mark the data packets that fitting the trigger condition. At most 128 trigger marks are supported for counting and finding the needed data.